Free lunches and fussball tables might be perceived as popular benefits among offices these days, but company perks didn’t even make it to the top five pros of working at a startup in our online startup survey. When asked what employees liked most about working at a young company, good team dynamics and an open work environment were among the most commonly named reasons. “For the most part, the culture of a startup is very different to a large, established corporation. It feels more personal, and employee ideas still have a chance of being heard,” wrote one participant. 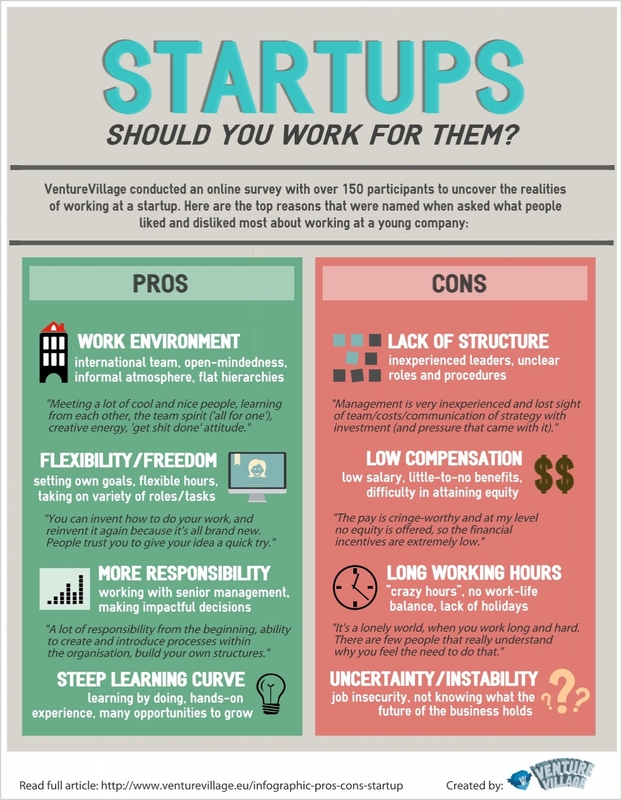 On the other hand, survey respondents – who worked across a variety of departments with highest participation from marketing, business development and engineering – named a lack of organisational structure and low salary as the downsides of joining a startup. Though a certain amount of hype can be good for a startup ecosystem in terms of bringing in talent, it can also breed a culture of self-righteousness and “evangelic startup people preaching that their companies are something like the Mecca”, said one respondent.